Shirts With Random Triangles: Bear Bryant wearing Texas A&M cowboy boots. Keeping in this morning's honoring the 100th anniversary of the birth of legendary Alabama head football Paul "Bear" Bryant, here's a photo of The Bear wearing a pair of Texas A&M cowboy boots to a Dec. 29, 1967 press conference before the Jan. 1, 1968 Cotton Bowl with then-Texas A&M head football coach Gene Stallings. The Bryant-led Crimson played the Stallings-coached Aggies in the 1968 Cotton Bowl. 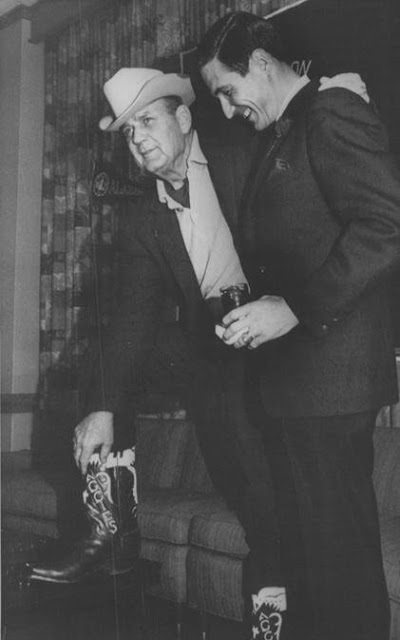 The boots were reportedly given to Bryant by an Texas A&M alumus after the Aggies first and only Southwestern Conference title under Bryant in 1956. Stallings was a defensive end on that team. The Aggies went on to beat Alabama in the Cotton Bowl 20-16.